These hiking trails listed below have been hiked by us extensively along with being carefully documented and photographed in all 4 seasons. This project has taken years and we are hoping to end up with the most extensive, accurate and interesting information on Hiking on the Great Smoky Mountains National Park. Have patience with us - it will be well worth the wait! 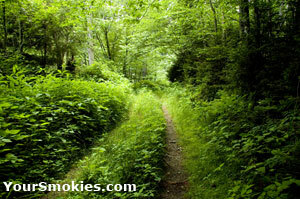 The Boulevard Trail in Newfound Gap Area for Hikers Only is Open with Agressive Bear Warning! 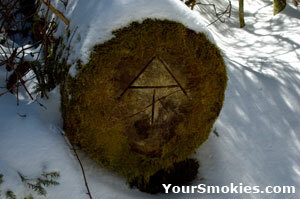 A log in winter with the Appalachian Trail Marking. 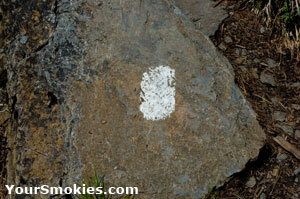 A Vertical while line marks the Appalachian trail. 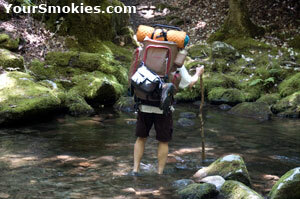 The following list of sections of the Appalachian trail starts at the Fontana Dam trailhead in North Carolina in the Southwest section of the Great Smoky Mountains national park heading to the North East section exiting the GSMNP at the Tennessee - North Carolina border between Cosby TN and Big Creek NC.